This is a 340g bag of 100% cocoa nibs from Madagascar. These cocoa nibs are cracked from fine Madagascan cacao beans, which gift a mouth-watering, citrus edge and a roasted, fruity flavour, a little like a fruity filter coffee. These nibs contain no sugar at all, and are made with nothing but cacao. This is perfect for a variety of uses in the kitchen. These cocoa nibs don’t just taste good, they do good. Madagascan chocolate maker Menakao proudly crafts its chocolate on the island, using only local ingredients. Unfortunately, this is rare even for craft chocolate – it’s estimated that less than 5% of the world’s chocolate is produced in the same country the cocoa is grown. 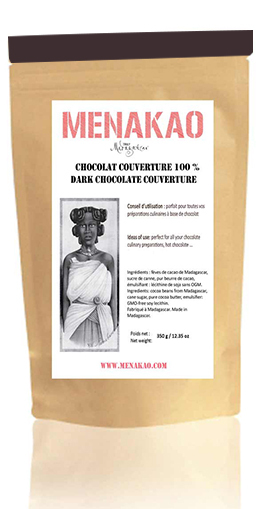 By making the chocolate in Madagascar in addition to growing the cacao on the island, Menakao generate about 4-5 times the benefit of Fair Trade for the local Madagascan economy.